Inattentional and change blindness are two fascinating phenomena that more people should be aware of. 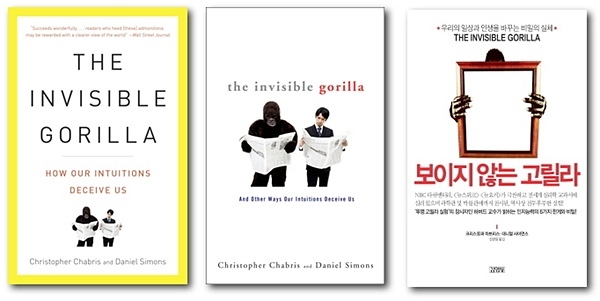 The Invisible Gorilla describes them as well as some other interesting and surprising psychological research. This book has been out for over three years, and I’ve been meaning to write a review forever. What brought it back to my attention is a recent news story on the safety implications of voice-controlled systems in cars. Just because your hands are on the steering wheel and your eyes on the road doesn’t mean your attention is anywhere near. Attention is a key element in our cognition, but it is only poorly understood. Christopher Chabris and Daniel Simons have done some of the ground-breaking work in this area, in particular about inattentional blindness and change blindness. Both phenomena have highly entertaining experiments at their basis. The Selective Attention Test that the book gets its title from asks people to count the number of times one of two ball-playing teams passes the ball. After a minute, a guy in a gorilla suit walks through the scene. Most people are so focused on the task that they don’t see the gorilla. The Door Study is even more bizarre: an experimenter asks a stranger for directions in the street. Two workers appear with a door that they carry between the two people. The workers are part of the experiment, and as the door passes between the two people, the experimenter is replaced. A large number of people do not notice the change – and if they do, they don’t seem to be concerned that they’re suddenly talking to a different person. The Invisible Gorilla also covers Other Ways Our Intuitions Deceive Us, as the subtitle promises. It is all written well, based on little stories and with references to relevant research papers. There is some overlap with Daniel Kahneman’s fantastic book, Thinking, Fast and Slow, though they nicely complement each other (Kahneman’s book was published a year later and references Chabris and Simons’ work). To explore the effects of cell phone conversations on inattention directly, Brian Scholl and his students at Yale used a variant of the “red gorilla” computerized task described earlier and compared a group who performed the task as usual with one that performed it while simultaneously carrying on a cell phone conversation. In their particular variant of the task, about 30 percent of the participants missed the unexpected object when they were just doing the tracking task. However, participants who performed the task while talking on a phone missed the unexpected object 90 percent of the time! People want to be increasingly connected, but their ability to attend to all that information does not change. Chabris and Simons’ work is becoming more relevant as the number of distractions increases.